With the initiative and support of University Grants Commission (UGC) and Bangabandhu Sheikh Mujibur Rahman Agricultural University (BSMRAU)-IQAC (Institutional Quality Assurance Cell), the Self-Assessment Committee (SAC) of Fisheries program in BSMRAU organized a day-long Team Building Workshop on “Self-Assessment and Quality Assurance of Faculty of Fisheries” at the Conference Room of the Faculty Building on 01 November 2017. The main focus and objective of the workshop was to build awareness and team-work spirit among the faculties and non-academic staff and on different issues related to self-assessment and quality assurance. The workshop was graced by the presence of Prof. Dr. Md. Giashuddin Mia, Hon’ble Vice-Chancellor, BSMRAU as the Chief Guest. Among others, Prof. Tofayel Ahamed, Treasurer, Deans of all Faculties, Prof. Dr. Md. Abiar Rahman, Additional Director (BSMRAU-IQAC), BSMRAU-QAC members were present in the workshop. Prof. Dr. Md. 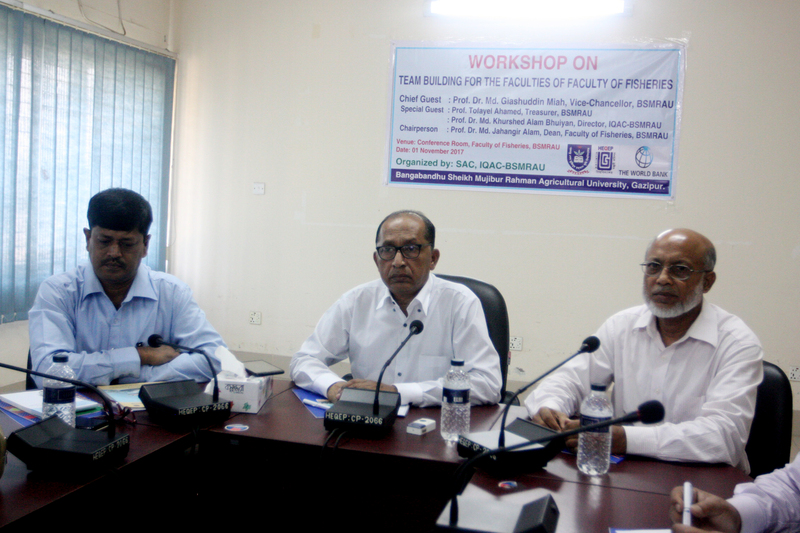 Jahangir Alam, Dean, Faculty of Fisheries presided over the workshop. The Dean, Faculty of Fisheries and the Team Leader (SAC-FF) welcomed all guests, faculties and officers and presented the purpose and intended outcome of the workshop. The Vice-Chancellor mentioned the importance of self-assessment in assuring the quality in fisheries education in the university. He advised all faculties to sincere and committed to academic and research as well for quality enhancement of Faculty of Fisheries.